Apple recently announced that it was acquiring Beats Electronics and Beats Music, the companies known for popular and stylish headphones and an up-and-coming music subscription service. Here are some of the important details of the deal. What’s Apple paying for Beats? Apple is paying $2.6 billion initially and, in the future, will vest an additional $400 million. Does all that money go to the founders? Beats was co-founded by Jimmy Iovine (I-oh-veen) and Dr. Dre (Andre Young), and while they’ll realize several hundred million from the deal not all the money will go to them. Companies such as the Carlyle Group and Universal Music have invested in Beats and will take their cut when the deal is completed sometime in the fourth quarter of this year. Will the Beats brand exist once the deal is complete? Yes. Although Apple owns both Beats Electronics and Beats Music, they will each continue to exist as separate brands. What does Apple get from the Beats deals? Three things: Beats Electronics, which is responsible for the company’s headphones; Beats Music, the subscription arm of the company; and the services of both Iovine and Dre. Hardware in the form of headphones is just one part of the deal. More specifically, Beats Electronics makes over a billion dollars a year on its headphones and accessories, which will add to Apple’s bottom line. Beats Music gives Apple an operating subscription music service, which means Apple doesn’t have to create one from whole cloth. And Iovine and Dre (who will join Apple and work under Apple senior vice president of Internet Software and Services, Eddy Cue) have connections in the entertainment business that may help Apple with current and future entertainment deals. Does this mean that the next iOS devices will ship with Beats-branded headphones? Probably not. Currently the least expensive headphones made by the company—the Urbeats se earbuds—retail for just pennies under $100. It's possible Beats will have some say in the design of future headphones, but it's unlikely Apple will mix the two brands together in this kind of way. Will iTunes Radio disappear because of the Beats deal? Apple has offered no indication that this will affect iTunes, iTunes Radio, or iTunes Match in any way. In Apple’s press release Cue described Beats as supplementing both the free iTunes Radio and the download business of the iTunes Store. Wasn’t Beats involved with HTC? It was. In 2011 Taiwan’s HTC paid $300 million for a 50-percent stake in Beats. In 2012 it sold back half that share and then the rest in 2013. Iovine claims the deal didn’t work out because of a culture clash between the two companies. Prior to the HTC partnership, Beats had teamed up with Monster. What makes Beats Music different from other music subscription services? 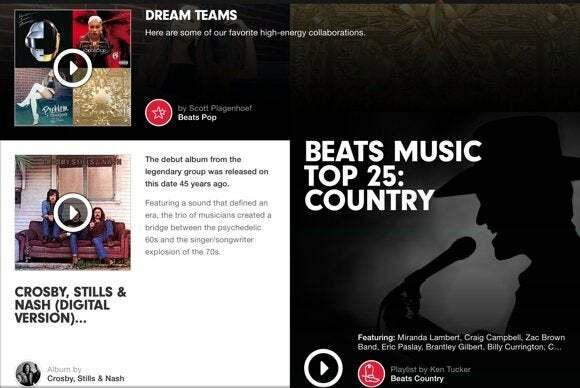 Beats Music focuses a great deal on music curation. Rather than depending largely on algorithmic music discovery—where music recommendations are made based on the kind of music you’ve listened to in the past or have in your device’s music library—Beats helps you discover music via playlists created by people who know particular genres inside and out. If you want to explore jazz, for example, you can be sure to find hundreds of playlists that will help you on your way. That doesn’t mean that Beats has abandoned algorithms altogether. The service will still offer suggestions based on artists you like, music you’ve listened to, and a mood-based discovery system called The Sentence. You can also search the service by artist, album, and track. Beats Music will offer suggestions based on artists you enjoy. How many subscribers does Beats Music currently have? Around 250,000. In comparison, Spotify (which, unlike Beats, is available internationally) has over 10 million paying subscribers. So the Beats Music service is available only in the US? How many tracks does Beats offer for streaming? What does it cost to subscribe to Beats Music? Individual subscriptions cost $10 a month and allow you to stream to up to three devices. If you’re an AT&T customer you can purchase a family plan for $15 a month, which allows up to five people to stream music on up to 10 devices. You can try the service for free for two weeks. Can I download music from Beats? Yes. It, like other subscription services, allows you to download tracks for offline play. Which devices work with Beats? Computers using a compatible Web browser (Safari, Chrome, Firefox, and Internet Explorer), compatible iOS devices (iPhone 4 and later, iPad 3 and later, iPod touch 4th generation and later) running iOS 6 or later, Android devices running Android 4.03 or later, and Windows Phone devices. It’s also supported on Sonos multi-room music systems. It’s not currently available on the Apple TV, though it seems likely that will change at some point. What’s the audio quality like? Through your Web browser Beats streams the majority of its tracks as 320 kbps MP3 files. A minority that aren’t available at that bit rate are streamed at 256 kbps. On mobile devices the standard audio quality is 64 kbps HE-AAC. You can choose instead to stream at a higher quality of 320 kbps MP3. The point of using lower-quality (and therefore, smaller) files is to help you stay within your data plan when streaming over a cellular connection.